Your role as Musical Director is demanding; you have multiple agendas and limited rehearsal time. Professionals have an incentive to solve problems in order to succeed. 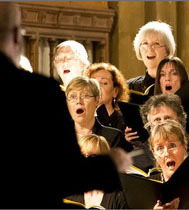 Some choir members may rely upon snippets of information gleaned from an occasional lesson or coaching session, whereas a professional realises that ongoing learning and development involves a process of continual skill building and maintenance. All singers need to maintain their voices on a regular basis to achieve the best results. Since his graduation from the Guildhall School of Music and the Opera School of the Royal College of Music, Mark has enjoyed working with many fine conductors and directors in both oratorio and opera. Mark has personal experience in the amount of work and commitment required for a good performance and has devised strategies to facilitate this for the benefit of your choir.